A chocolate-almond tart shell is the finishing touch to this decadent vegan dessert! 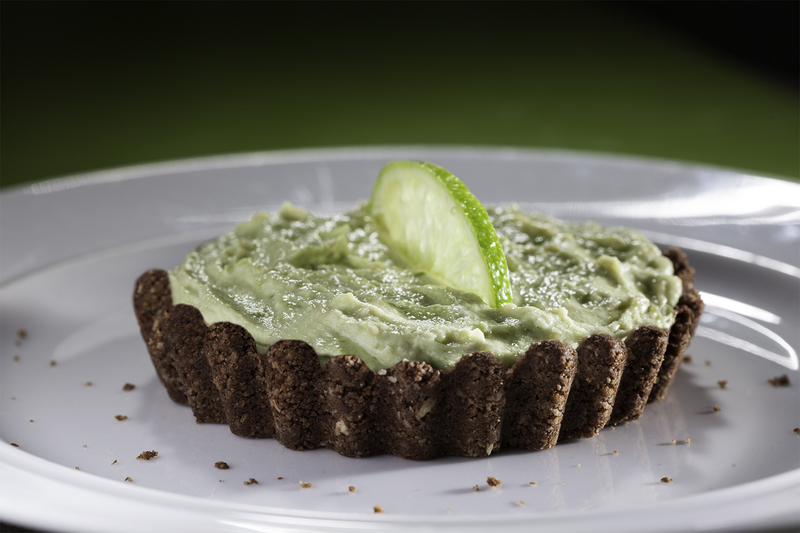 Believe it or not, avocados give this tart it’s creamy texture along with coconut cream… so all you taste is limey-sweet goodness! I prefer honey as the sweetener, but if you are a true vegan, use agave nectar. Whip chilled coconut cream in a mixing bowl with a hand mixer. Halve and pit avocados and scoop out flesh into the bowl along with agave or honey, lime juice and zest. Mix until thoroughly incorporated and creamy. Cool in refrigerator for at least 1 hour. Preheat oven to 350 degrees and grease tart or tartlet pans. Add all ingredients in a mixing bowl and stir until well incorporated. Press dough into the tart shell, to cover the bottom and up the sides. Bake for 10 minutes. Remove tart shell from pan and cool. When crust is thoroughly cooled, spread lime filling on top of tart shell and garnish lime wedges. In salute of St. Patrick’s Day, why just have corned beef and cabbage? 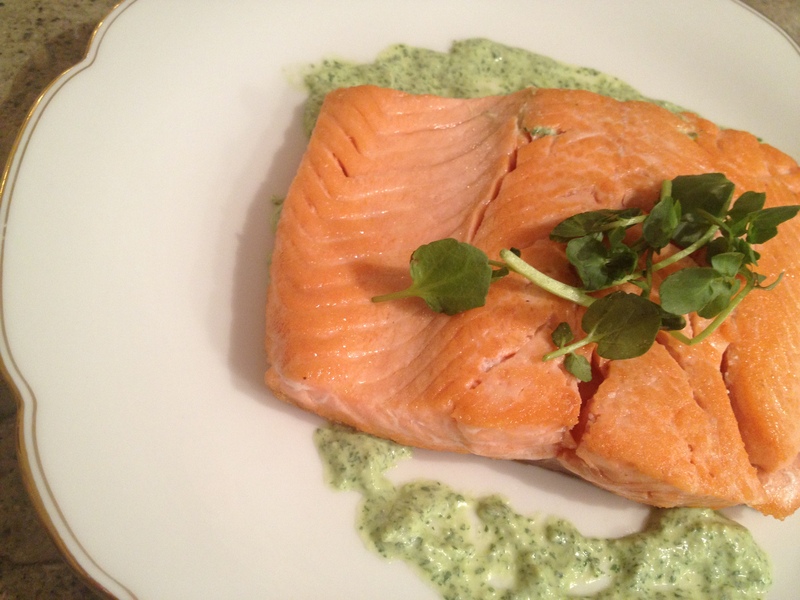 Instead reap the health benefits of wild salmon paired with a spring-fresh green watercress sauce. On medium-high heat, coat a skillet with olive oil and heat, but not smoking. Salt and pepper top of salmon. Add fish, skin side down, and sear until 1/4 thickness of the fish turns opaque. Carefully turn to the other side and sear until desired doneness. Set aside. In a pot, boil water and blanch watercress for 30 seconds. Immerse in an ice bath to retain color. In a high speed blender, blend dijon and yogurt. Add watercress, salt and white pepper and blend until throughly blended and smooth. Serve alongside salmon. Oatmeal is not just for breakfast anymore! Inspired for St. Patty’s Day, this savory side dish is not the usual rice accompaniment to most meals. Asparagus and spinach with hints of lemon pair well with many entrees for spring, especially fish and poultry. Of course, for the less adventuresome, substitute rice for oatmeal and follow the recipe as is. Note: Although steel cut oats are probably the best choice, I opted for rolled oats… the only gluten-free variety I could find. Heat 1/4 cup EVOO in a heavy skillet on medium and add onion and shallots. Stir until softened, about 7 minutes. Turn heat to low and stir intermittently, for approximately 20-30 minutes, until onion mixture is browned and caramelized. Set aside. Saute leek and garlic in 3 Tablespoons EVOO until softened and set aside. Snap off asparagus ends and blanch for 2 to 3 minutes in boiling water, till softened but firm. Immediately immerse in an ice water bath to retain color. Heat 3 more Tablespoons olive oil in a saute pan and add spinach, cooking only until starting to wilt, no more than one minute. 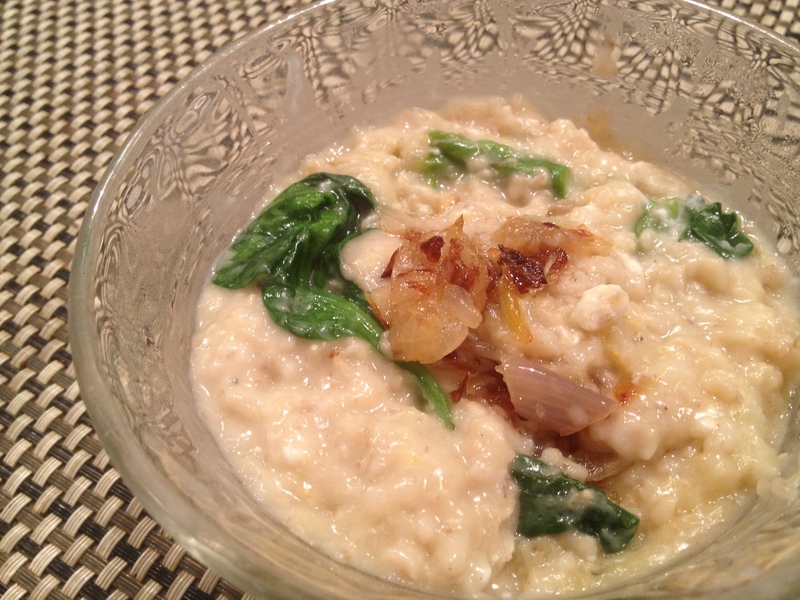 Cook oatmeal as directed on the package substituting vegetable broth for water. Cover and let rest for 10 minutes. Stir in leek-garlic mixture, cheese, lemon zest and salt and pepper. Chop asparagus into 1/2 inch pieces and add to oatmeal. Also add spinach by stirring carefully not to tear spinach leaves. Top off with onion-shallot mixture and a speciality lemon olive oil. This vegetarian version of traditional “pigs-in-a-blanket” stuffed cabbage is a knockout when paired with the fresh flavors of parsley and cilantro. The challenge? To make a vegetarian stuffed cabbage that’s absolutely delicious. Mission accomplished with the help of Chef Andrea Dante from Mad Gourmet in Guilford CT who inspired me to turn her vegetarian eggplant “meatless” meatball mix into the filling for this dish. The pesto is the taste kicker which adds a punch of color cabbage dishes usually lack. Make it vegan by omitting the egg, rolling the cabbage leaves a bit tighter to hold the filling. Enjoy! Peel and slice eggplant into 1/4 inch rounds. Brush with olive oil, sprinkle with salt and pepper and grill 2-3 minutes on each side, until soft but not mushy, being careful not to over-char. Eggplant can be grilled in a grill pan instead. In a food processor, pulse eggplant with garlic, tomato paste, shallot and egg. Put mixture in a mixing bowl and add cornstarch, rice and bread crumbs. Let rest for 20 minutes to allow the moisture to be soaked up. Fill enough water in a stock pot to cover the whole cabbage and bring to a boil. Meanwhile, peel off outer cabbage leaves and core the cabbage to remove the middle stem. Immerse cabbage in boiling water for 20-30 minutes, depending on the size of the cabbage, or until leaves are tender but firm throughout. Separate cabbage leaves and unfold flat. Place enough eggplant mixture to roll up in cabbage leaves being mindful not to overstuff. Continue rolling up eggplant mixture in each cabbage leaf. Place stuffed cabbage in pyrex dish with 1/4 to 1/2 inch of vegetable broth and cover. Bake for 20-25 minutes or until filling is hot. Remove any thick stems from parsley and cilantro. Place all ingredients except oil in a food processor pulsing until parsley and cilantro are blended but not finely chopped. With the food processor on, drizzle olive oil in a steady stream until desired consistency (I prefer this pesto to be coarsely pureed). 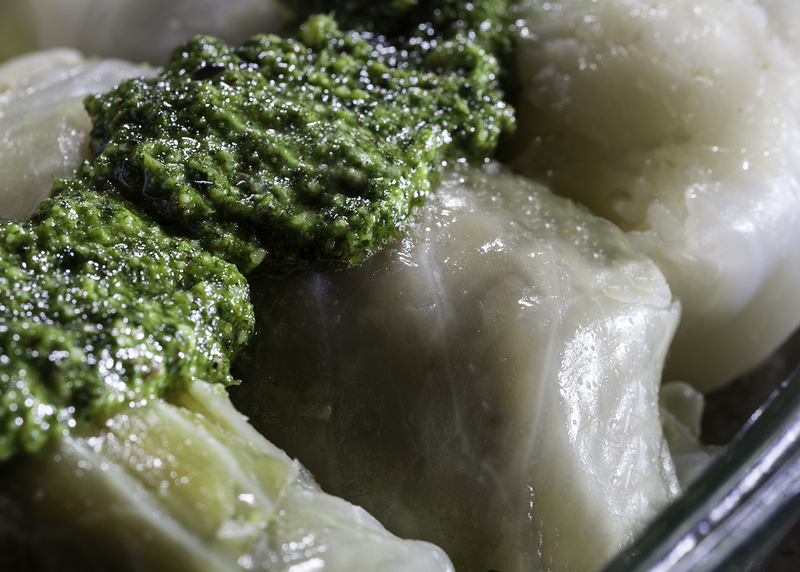 Dollop parsley pesto on top of stuffed cabbage and serve. Green as the Emerald Isle, this pea soup laced with tarragon is perfect for a spring day when you still want to warm up but with lighter fare. This soup is like a bowl full of spring …. green and garden fresh! But you don’t have to wait until your garden produces a bumper crop as flash frozen organic peas are readily available in your grocery store. If you can’t find sugar snap peas, substitute with more organic peas. Saute onion and celery in EVOO in a medium stock pot until softened but not browned, approximately 5 minutes. Add vegetable broth and salt and pepper. Cover and simmer 10 minutes. In a separate pot, blanch sugar snap peas in boiling water for 1 minute. Drain and immerse into a ice water bath to preserve the green color. Boil peas for one minute, drain and add to the ice bath. 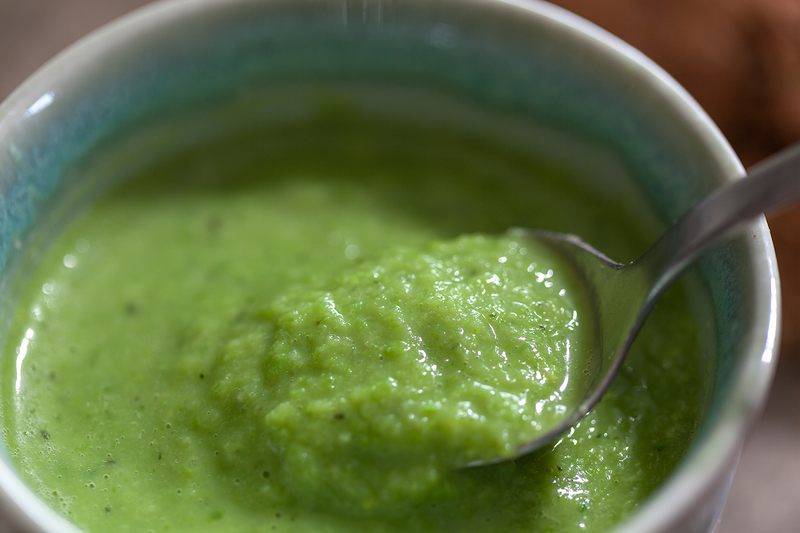 Remove all peas from the ice bath and puree in a high speed blender. Push soup through a sieve to remove any remaining strings from the sugar snap peas. Serve with chopped parsley and chives on top if going vegan, or with a dollop of creme fraiche and applewood smoked uncured crumbled bacon for added flavor. May be served hot or cold. This bread is so good just hot out of the oven, you’ll be tempted to slather on the best Irish creamery butter on each slice! Spelt, an artisan grain, is my favorite flour to bake with and it’s the only wheat I use. I found this Irish Soda bread version from the Healthy Chef, because when I can’t make it better myself, I give credit where credit is due. Nutty and courser than regular flour, spelt gives this Irish Soda Bread a rustic texture with added flax seed meal. Almond milk is the dairy-free milk you want to use for this recipe and when mixed with lemon juice it become “vegan buttermilk.” Extra virgin olive oil adds another dimension of flavor with a touch of sweetness from honey. 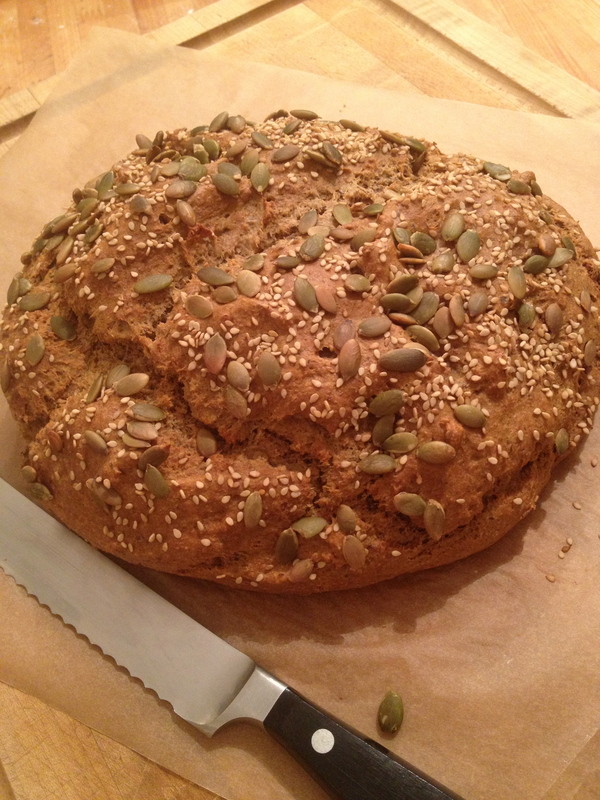 And it’s all topped off with pumpkin, sesame and sunflower seeds which roast in the oven as the bread bakes. A superfood tea, matcha is finely ground whole leaf green tea. So it’s loaded with good stuff! Personal preference will decide whether you dredge each truffle in matcha or sprinkle it lightly on top. Coconut milk is used instead of dairy. Stay vegan by choosing chocolate chips free of dairy or soy, and also gluten free. And yes, go ahead and substitute your favorite liqueur for the vanilla if the mood strikes you. For the best truffles, choose only the finest chocolate. One further note. As a reformed purist, I made an exception to my rule of not using microwaves. You’ll get the same results melting the chocolate in a double boiler, but this is one dish requiring minimal time in the micro and the results are perfect every time. I guess some rules are made to be broken. In a glass measuring cup, melt chocolate chips and coconut milk in a microwave on high heat for 1 minutes and 30 seconds. Even though the top may appear watery, stir chocolate thoroughly up from the bottom until incorporated into a thick, melted chocolate mixture. If chips are not quite melted, microwave for 30 more seconds, being carefully not to overheat or chocolate can burn. Add vanilla and stir until smooth and fully blended. Transfer to a medium glass container with a wide top so that chocolate mixture is at least 1/2 inch thick. Cool for 15 minutes then cover with plastic wrap. Place in the refrigerator for 3 hours to solidify, but still soft enough to roll into balls. Scoop chunks of chocolate in between your palms and mold into 1 inch truffle balls. 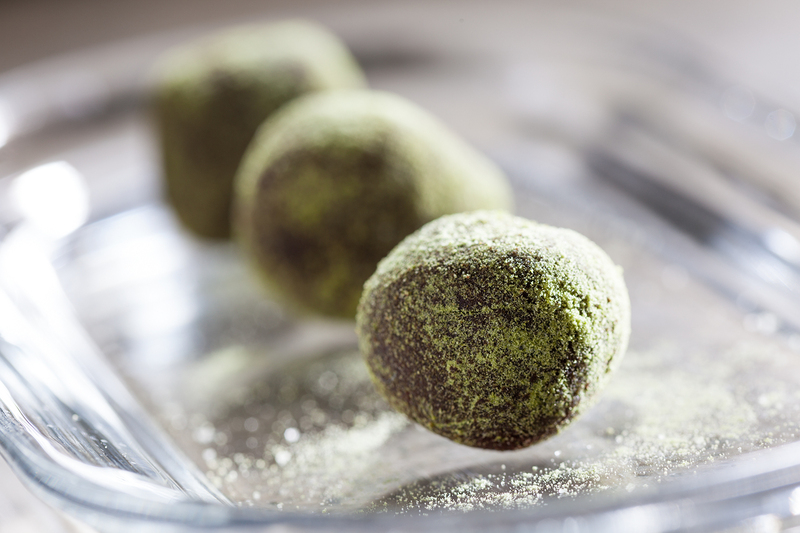 Sprinkle on top , lightly coat or dredge truffles in matcha powder and refrigerate until ready to serve. Start the morning with a green smoothie, and set the tone to infuse your body with good stuff all day long. 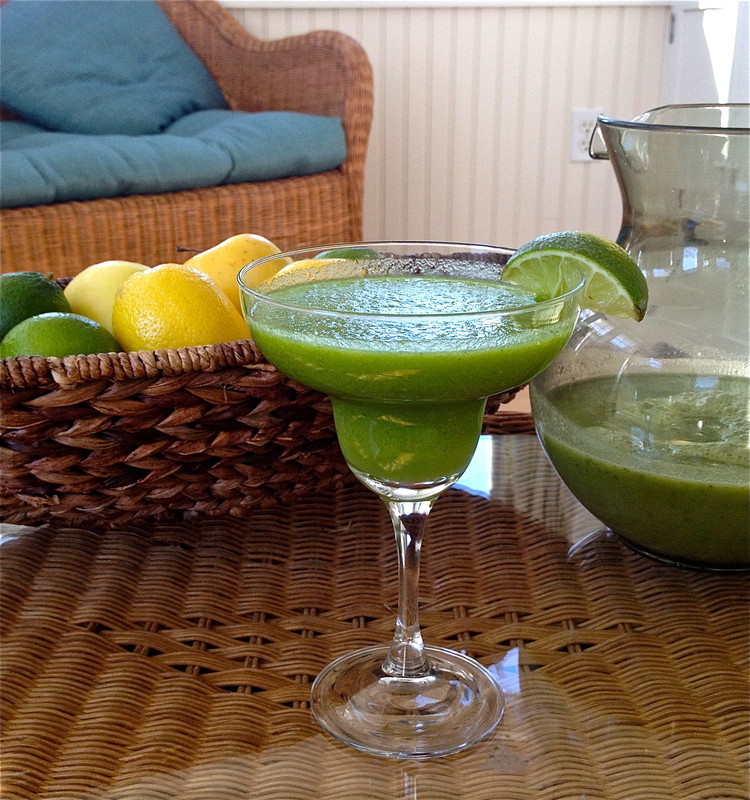 Get energized with this green smoothie loaded with antioxidants! Kale is the superfood staple in this smoothie, but feel free to substitute spinach or another dark leafy green. Ginger gives this juice some punch while mango and apple sweeten it up, along with a bit of tart from limes. Celery and fennel completes the picture making this not just another breakfast drink. Place all ingredients in a high speed blender and blend till smooth.